I couldn't resist making another Box In A Bag (see previous post). Edited To Add: Dawn asked about the dimensionals of the finished Box In A Bag. It measures approximately 5 1/2" tall x 5" wide at the top and 2 1/2" wide at the bottom x 2 1/2" deep. Wow, these are so cute! I love the way both of yours turned out. Oh my word! This is brilliant! How darling is that!?! I love this idea and will have to steal it and get busy! thanks! Well no wonder you had to make more! This is totally delightful! I just adore the stripes and the flowers as well! Nancy...You win again :) This is my favorite out of all the box in a bags I have seen. Awesome for the 4th of July. Can't wait to see what is next!!!!! Ok, this is CRAZY, I am ON VACATION and I am having iSTAMP withdrawals......before we leave our hotel room I HAD to check out Nancy's blog. I'm never disappointed when I check in here. LOVE these bags!! They are so cute, may have to CASE for my CLUB! Thanks for sharing your beautiful work, Nancy! I absolutely LOVE my Azure paper pack...and was just thinking it's (past) time to do some 4th of July cardmaking! Thanks for sharing this...I'll be checking your site again. Oh man, I love this! 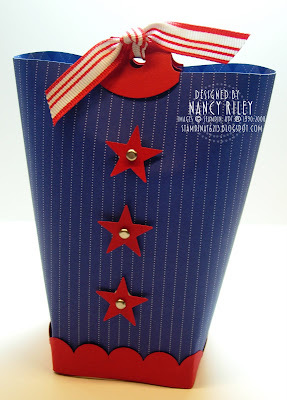 I just posted my patriotic stamp club projects earlier, now I'd rather make this! Darn you! ha! ha! Both of these are so cute and fun!! I love them!!! Oh wow...I want to make one of these too! These bags are adorable...what a great idea! I need to dedicate at least one day a week to stopping by your blog and casing everything you do... you are amazing girl : ) ! Nancy, this is FABULOUS! Oh my goodness! WOW! Those are so cute. Thanks for sharing. Very patriotic--I saw your original post and very much want to try this bag! These are really clever, I am going to have to try them!